4. Due to increased listings, properties under $400,000 are more available as condominium apartments than single-family homes. 5. Statistics display that now is the time to buy due to lower prices and greater inventory though buying a condominium will have a better price than single-family houses for sale. The residential resale housing market posted some strong November activity by encompassing 1,782 units, a 3% increase over last years and nearly 13% above long term averages. According to CREB® chief economist Ann-Marie Lurie “Relative to other major centers, economic growth in Calgary remains one of the strongest in the country. Employment opportunities and relatively higher wages have encouraged people to move here, supporting the demand growth in our housing sector.” That statement shows that Calgary is “the” place to live in! With jobs growing and the economy here prospering the most out of the whole country, there is no reason not to invest in the Calgary real estate market. On the other hand, new Calgary real estate listings are outgrowing the sales here which are supporting a 22% year-over-year rise in November inventories to 3,849 units. Though inventories have recorded significant gains, they are below long-term averages for the month. Here is what CREB® president Bill Kirk had to say about the situation. 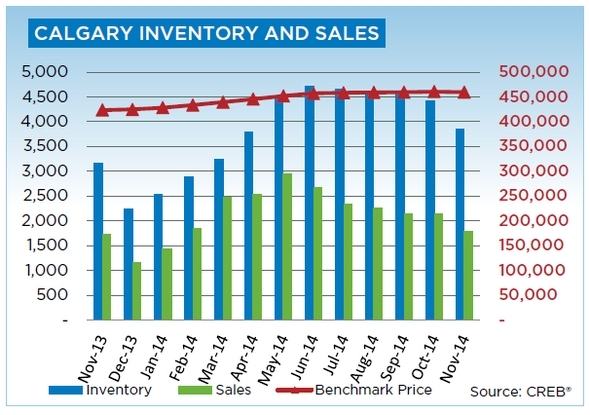 “Over the past year, inventories have been low in the city, limiting some of the choice for consumers. While availability in specific segments and price ranges vary, on the whole, the recent rise in inventories will be welcome news for many buyers.” So we see there weren’t many options to choose from in the past when it came to buying real estate, so this surplus in Calgary real estate listings really expands the types of properties available with better prices for buyers. Like previous months, November saw double-digit growth in year-to-date sales for all property types. The strongest gains in growth were in Calgary condominium apartments and townhouse sectors which had a combined growth of over 19%. 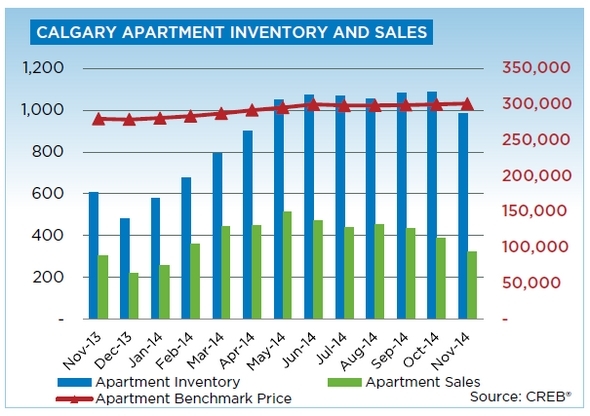 When comparing year-to-date sales figures, both condominium sectors are at record levels. CREB® president Bill Kirk states “Overall, buyers looking for product under $400,000 will find more options in the condominium sector because supply levels have improved. In the single-family sector, however, declining supply in that same price range has created much tighter market conditions in that segment.” There you see it is easier to find condominiums at an affordable range, than it is to find single-family houses for sale in Calgary. 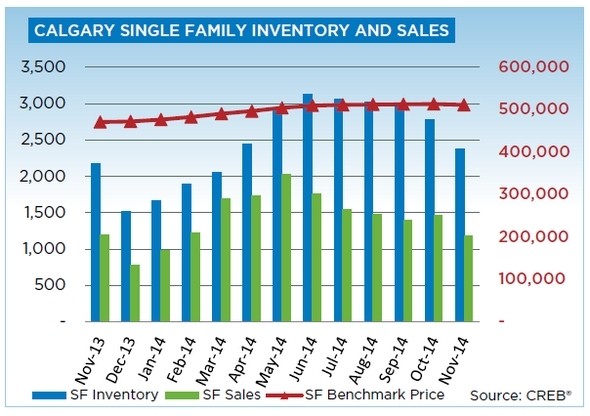 Single-family sales totaled 1,181 units in November, a 1% year-over-year decline. Meanwhile, year-to-date activity totaled 16,481 units, a 6.2% increase over the previous year. 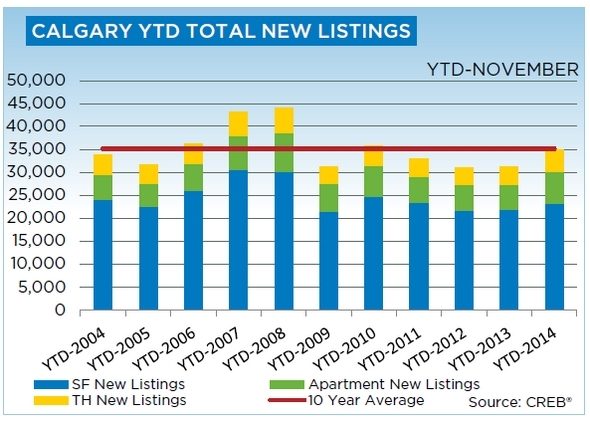 In comparison, new listings increased 5.9% to 23,207 units over the same time frame. November also showed moderate growth in single-family unadjusted benchmark prices, totaling $511,300 which is an 8.7% increase over 2013. While year-over-year price gains remain strong, price growth has slowed from the double-digit rates posted earlier in the year. 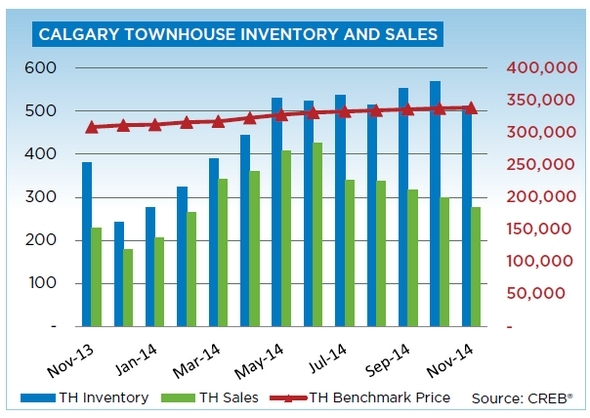 Meanwhile, unadjusted benchmark prices for Calgary condos and townhouses totaled a respective $300,700 and $338,600. Like the single-family Calgary housing sector, both condominium sectors have seen price growth gradually ease from double-digit levels in this real estate market. However, it was only this past June and September that saw condominium apartments and Calgary townhouses price recover from previous highs. As you can see, more listings have given way to better pricing. Though single-family homes can be more expensive, if you’re looking for property under the $400,000 range in Calgary, condos are the way to go. To see homes available in Calgary at various prices to match your budget, use the form to the right of this article and see what I have to offer. In addition you can view my latest listings of Calgary real estate or peruse the Calgary MLS for various types of properties.